Today we had a real weekend day on Mars! We breakfasted on a delicious, fresh-baked casserole made of reconstituted egg whites, Velveeta cheese, and pre-cooked bacon, based on a recipe Carla found. 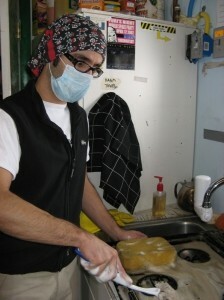 Then we spent a couple of hours cleaning house—wiping, sweeping, vacuuming, and mopping. Mike, who had been up until the wee hours collecting data with the newly operational radio telescope, retired to his stateroom ensconced in his headphones to listen to the buzz of the night sky, based on recordings collected while the crew slept. Apparently this was sufficiently sleep-inducing that he succumbed to a nap. Actually, we’d all had something of a late night because we decided to stay up until midnight so as to transfer some large files (e.g., download printer drivers and upload movies to YouTube!). Our bandwidth from 5 a.m. to midnight is severely restricted, so the only practical way to do these tasks is to wait for that midnight to 5 a.m. window. To pass the time until midnight, we played several games of Guesstures, which is a variant on charades that we found to be quite entertaining! Carla emerged as a real champion of portraying a variety of characters and concepts with lightning speed. Mike is feeling inadequate and is intent on a rematch. Luis complained that the stress was killing him, so we strapped Brian’s heartrate monitor on him and found that sure enough, his heartrate would go from about 90 (when guessing) up to about 160 (when portraying concepts and trying to get his teammates to guess!). It was a slow day in Internet-land today. An unattended download after our late-night session did not complete by 5 a.m. (and yes, we know better!). Therefore, around 6 a.m., we’d apparently consumed our entire bandwidth for the day and our access was throttled back (to a total allocation of about 3 kbps—aie!). This was excruciating for all involved. I found it particularly painful because I’d so hoped to use this slow, indoor day to make real progress on my actual research project: automatically associating geotags with images that don’t otherwise have GPS coordinates associated with them. I spent most of the day simply identifying which pieces of software I lacked and, because of the bandwidth restriction, could not download. Prior to the mission, I’d planned to do my analysis in Matlab, and had downloaded several packages that I would use to analyze the images with. But even on good net days here at the Hab, I can’t maintain a good enough connection to the Matlab license server to make that work at all. So I decided to switch over to Python, which I can run independently on my computer, without net access. Except that I then also needed to install new packages for the same analysis goals, in Python rather than Matlab. I’ve made some progress, but not nearly what I’d hoped for! The day was not, however, a total loss. After lunch, Brian and Luis suited up for EVA 13. 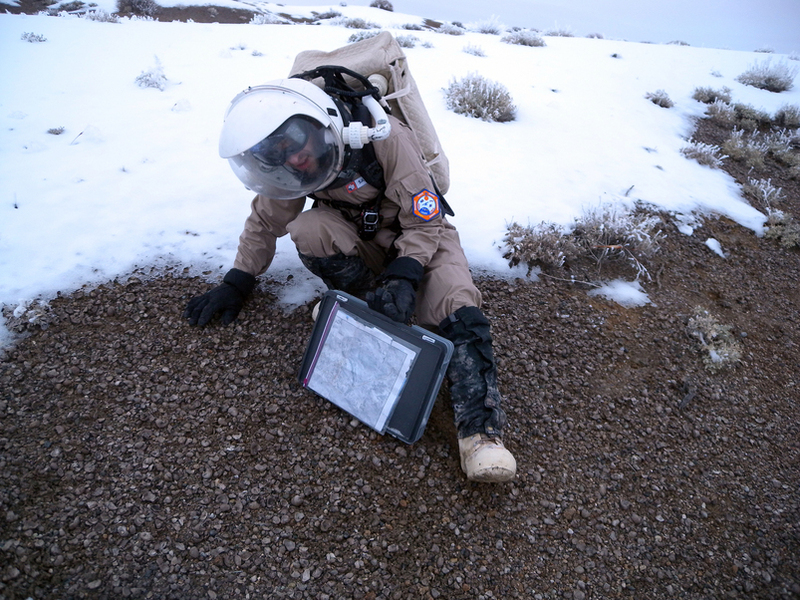 Their goal was to traverse Radio Ridge Road to check out a potential site for a seismic survey, recommended by Carol Stoker, the Commander of MDRS Crew 83. That crew had surveyed an inverted channel feature with ground-penetrating radar. 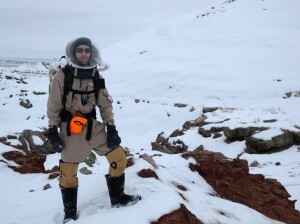 Luis wanted to collect some more rock, soil, and snow samples—the more diverse, the better. They set out with Luis in the lead, since he thought he remembered the way from EVA 6 (both EVAs headed up Sagan Street at the beginning). They made it to the base of Olympus Mons but at that point encountered a few dead ends, because the terrain looked quite different with snow blanketing it. The road was steep, and once Brian had to get out and push Luis’s ATV to help keep it moving. As the follower, lucky Brian was able to avoid the sticky spots that Luis discovered. They struck Radio Ridge Road without difficulty. From up on the ridge, they could see cliffs all around, with snow collected in patches on the red layers. 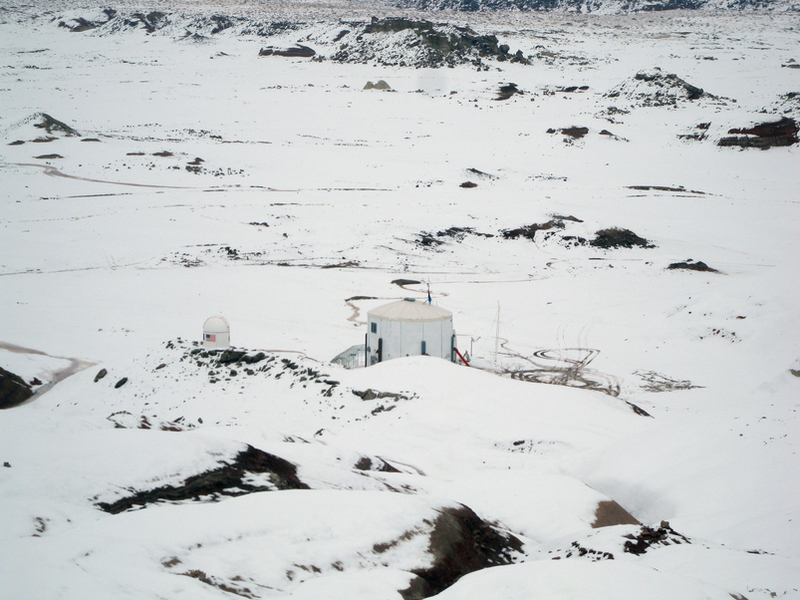 They could also see the Hab from above, as well as Musk Observatory. They observed a lot of animal tracks along the way. They made their way south along the Ridge, seeking the GPS coordinates specified by Carol. As they went south, they encountered another ridge that intersected Radio Ridge perpendicularly—and this was the spot they sought. They walked the profile, and learned that it may not be smooth enough for the seismic survey, since the instruments need to be towed along the ground. As we had on EVA 5, they found a plethora of oyster fossils. In general, the whole environment was far more interesting than they had anticipated. Although it is largely a flat plain, it contains several small gullies that harbor microenvironments, ideal for Luis’s sampling goals. They found several sandstone samples containing more resilient layers inside which, when broken into, had streaks of what may likely be endoliths. Brian and Luis report that driving in the snow was really fun, and they felt they had good control, especially when shifting their weight to help the ATV maintain its balance and grip on the surface. The views, of course, were just incredible. Near the end of their return home (arriving as dusk was falling), they turned on their headlights and followed their own snow-bright pools of light back to the Hab. Originally, we had planned to hold a third exercise session today, but after the hours of indoor cleaning, and outdoor EVA activity, we just didn’t have the energy (and likely had gotten a lot of exertion already). Darrel and Carla cooked tonight, and it is our first experiment with the tinned corned beef, which I think most of us were apprehensive about. However, with a special BBQ sauce Darrel concocted, the pan-fried beef was actually quite tasty! Our meal was rounded out with potatoes au gratin and some peas and cauliflower—and for dessert, Carla had magically pulled together a pumpkin-spice cake with raisins. We’re still not sure how she is managing these feats of wonder, baking amazing desserts with no flour, no eggs, no milk, and barely any sugar. Yet everything is absolutely, mouth-wateringly delicious! Wow, Carla! As I sign off, Luis is engaged in the unenviable chore of cleaning out that critical breadmaker pan. We are all exceedingly grateful. First I would like to say I absolutely love the photo/eva routes page! Very contextual! I am a veteran of both MDRS/FMARS and have been wanting a system just like this! This page will help me with both geo and fossil mapping the area! I do have one question: Is it possible to integrate into the images the direction (cardinal) the images where taken? I am thinking like a remote science team member back on earth. I also noticed that some of your Gryphaea samples look like they might have some bio-erosion (drill holes)…am I correct? PS Sorry Brian that I never got back to you about the FMARS patch but I had some family issues. I believe my GPS camera does record the direction the camera was pointing when the photo was taken. Kiri’s auto geolocation photo study is picking apart the metadata in the image files, so if that information is there, we’ll try to pull it out and find a way to display it. Can you please describe further what you spotted in the Gryphaea samples? We’re not paleo experts here and aren’t sure what drill holes you saw. No worries about the patch, although if you do ever find the file, please send it my way. I don’t think I’ve ever seen delicious and Velveeta in a sentence where the writer wasn’t being ironic! Regarding Matlab – their application uses FLEXnet licensing, which supports a “pack and go” construct for concurrent licenses. In other words, you should be able to connect to the network, check out a license for, say, 2 weeks (or whatever the license administrator has configured), then not connect back until time’s up. Alternatively, if you have any rapport with the Mathworks rep, they can get you an extended demo license. Jim, that’s a great point. We do have “travel” licenses, but they don’t provide access to any toolboxes. I’d be needing the Image Processing Toolbox. But so far it’s looking like I can use the Python Imaging Library instead. We’ll see! If you need more info let me know and I will take a better image at home and send it to you. Also, did you see any Gryphaea on Mt. Olympus? 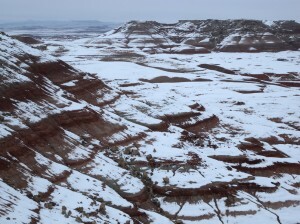 There are usually embedded within the green conglomerate unit of the Dakota. Will keep an eye out for the FMARS patch! I have a suggestion for your bandwidth woes. I’ve noticed that your webcams run all night, updating through the dark hours with new shots of darkness. Although my preferred hours are all vampiric (and I occasionally check in with high hopes of seeing someone making a late night hot chocolate run) I think the bandwidth might be better saved for your other activities? Could you put the webcams on schedules and black them out to help save a bit? That’s a great idea, Wendy — I’d love to configure the webcams to be on such a schedule (with permission from the powers that be ). I haven’t seen a scheduling option on the software that operates them so far. We could of course manually disable them at night (again with permission…). However, the main constraint for us isn’t upload bandwidth (the webcams upload a picture every 3 minutes) but rather download bandwidth. That’s where we run the risk of exceeding our 425 MB/24 hours limit and going into the throttled-mode (which lasts 24 hours). We do have unlimited (though not super-fast) downloads from midnight to 5 a.m. Last night I had a critical fink update/compilation going and had to set an alarm for 5 a.m. so I could wake up and make sure my computer wasn’t still downloading anything at that point. Stacy, we didn’t notice any Gryphaea on Olympus Mons, but the snow cover makes it difficult to do a thorough survey. We’ll let you know if/when we see more! My only experience with webcam software is Evocam, which is Mac only. It has a built in scheduling ability, very simple. If your webcams aren’t on a Mac, I’m happy to help you search for a different option with my less limited bandwidth. That’s what you’d do on Mars, right? Send your ‘lackeys’ back on Earth to research something for you! If it’s not worth the effort, I won’t pursue it. If you’re interested, though, I’m happy to check it out. I wouldn’t mind being an Earthbound lackey!